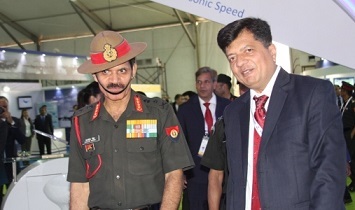 QUEPEM, GOA: Indian Army Chief General Dalbir Singh Suhag on Monday visited the BrahMos Aerospace pavilion on the opening day of Defexpo 2016 being held in Goa. Shri Sudhir Mishra, CEO & MD of BrahMos, briefed Gen. Singh about the BRAHMOS weapon system and its recent successful achievements and progress. The Indian Army has deployed the land-attack variant of BRAHMOS supersonic cruise missile system since 2007. It is indeed the only Army in the world in possession of such a powerful weapon. The multi-platform, multi-target, multi-mission missile, during two successive test firings conducted on May 8 and May 9, 2015, succcessfully validated its capability as a high-precision weapon having the prowess to knock down the enemy target in "top attack mode". Another successful test firing of the missile was carried out in November 2015 in Pokhran. BrahMos Aerospace is displaying the land, naval, and airborne configurations of BRAHMOS at Defexpo India. Also on display are the futuristic variants of the powerful missile system which include the BRAHMOS-NG (Next Generation), and the hypersonic BRAHMOS-II (K).